Home » Forget Kim. 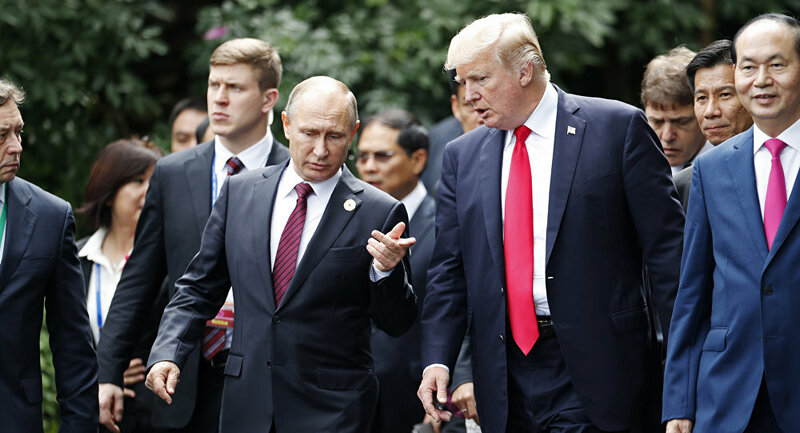 It’s Time for a Trump-Putin Summit – Now! Korea: The cancellation is a triumph for Trump’s national security team, most if not all of whom were horrified at the prospect of his meeting personally with Kim. (There was no telling what the Big Man might agree to if he met Little Rocket Man face to face. What if Korea actually were denuclearized? There would be no more excuse for keeping American troops on the peninsula! Disaster!) From the team’s perspective, scuttling the meeting altogether would be the best outcome, but derailing the date and cranking the nasty rhetoric back up will do for now. Talk of a Libyan model, even more than inclusion of B-52s in exercises with South Korea (which Trump reversed), got the job done. Now it’s imperative for the national security establishment to load Trump up with nonnegotiable demands (maybe patterned on Pompeo’s Iran provocation; see below) that Kim would have no choice but to refuse on the chance the summit gets rescheduled through the frantic efforts of South Korea’s Moon Jae-in – and maybe of Trump himself, if he still wants a shot at that Nobel Peace Prize. Pyongyang’s continued willingness to talk will register in Washington as desperation and an invitation for renewed pressure. Iran: Secretary of State Mike Pompeo has delivered to Tehran what only can be deemed an ultimatum. It makes Austria’s 1914 demands on Serbia look mild in comparison. Ultimata are designed to be rejected, “justifying” whatever action the threatening power has already decided upon. Tehran is being told to dismantle its entire regional security presence – or else. The “or else” means initially a campaign of destabilization (assassinations, fomenting domestic unrest, and insurrections by disgruntled ethnic and religious communities; see Syria 2011) or, if that fails, direct military action (see Libya 2011 and Iraq 2003). To trigger the latter look for a false flag or contrived “Iranian attack,” such as a naval incident in the Persian Gulf (see Gulf of Tonkin 1964). Also targeted by the ultimatum are the European countries aghast at US withdrawal from the Iran nuclear deal. In addition to smacking secondary sanctions on our satellites (officially, “allies” and “partners”), the harshness of Pompeo’s terms is designed to spook the Europeans into the vain hope they can restrain a reckless US bent on war by meeting Washington halfway (or three-quarters of the way, or nine-tenths of the way...) in helping to corner Tehran. Watch to see who will crack first: London, Paris, or Berlin? Syria: Despite Trump’s repeated assertion that he wants to get Americans out of Syria, there is reason to think we are digging in further. This has nothing to do with defeating ISIS. Rather, along with a planned buildup of Saudi and other foreign Sunni troops in the US- and Kurd-controlled zone, the principal target is Iran (see above). US policy in Syria is driven by Israeli and Saudi hostility to Iran, and Pompeo’s list of nonnegotiable demands includes withdrawal of Iranian (and Hezbollah) forces from that country. It is a mystery how the US, whose troop presence in Syria violates international law and probably American domestic law as well, has the right to demand the departure of forces present legally by invitation of the internationally recognized government. Punctuating US determination to confront Iran were new strikes this week against Syrian government forces, while Israel flaunted its first-ever combat use of the US F-35. Ukraine: The level of fighting on the Donbas line of control has intensified. Meanwhile Kiev forces show off tests of the Javelin antitank missiles they received from the Trump administration, which the Obama administration had earlier declined to provide. Ostensibly intended to deter a Russian attack – in which case they would make little difference – the Javelins could be used in an offensive against Donbas forces (perhaps in concert with an attack on the Kerch bridge connecting mainland Russia to Crimea) followed by a call for insertion of international peacekeepers. Russia considers the FIFA World Cup from June 14 to July 15 a prime time window for such an assault. A Dutch report assigning blame to – surprise! – Russia for downing MH17 comes at an opportune moment. In some ways this second Cold War is even more dangerous than the first one. The instincts of restraint and prudence that had been built up over decades of confrontation have atrophied. While both the US and Russia still maintain massive nuclear arsenals, new military technology has continued to make rapid progress in such areas as hypersonic weapons and cyber-warfare. Also, while during the first Cold War American and Soviet planners consciously sought to avoid direct contact between their forces in Third World proxy wars, today American and Russian forces come into perilous proximity to one another. Given Washington’s relentless determination to press Moscow to the brink in every theater, the consequences of even an unintended clash are not given the gravity they demand. he Trump regime has sabotaged Putin’s peace efforts in Syria, Iran, Ukraine, and North Korea.